Violet's Black Knight offers its own sound and style at a very competitive price. Flexible uncoloured sound. Useful pivoting head. Sleek black design. Cradle has to be purchased separately. Some plosive issues. 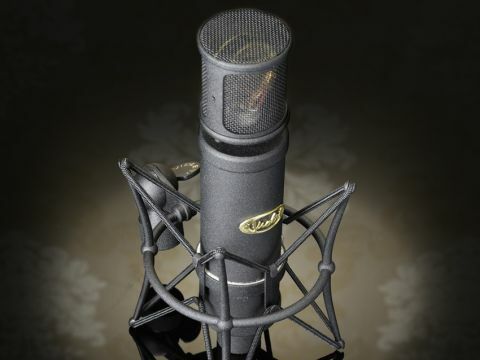 Like many of Violet's mics, the Black Knight is a phantom powered large capsule condenser. It has a dual-diaphragm configuration with fixed cardioid polar pattern and features the same VD27 capsule unit as you'll find in the company's Dolly mic. The Black Knight comes in a wooden box and is bundled with a screw-on mic clip (a black cradle can be purchased for an extra £49). There are no additional on-body switches and the only other physical features are the gold front badge and rear marking with serial number. It's worth pointing out that the BK's visually striking headstock also has a practical purpose, as it connects to the body via a ball-joint. This allows movement to a maximum of nearly 90 degrees to the left and right, 25 degrees down and about 10 degrees up. You're limited by three end-stop pegs but within these boundaries you can basically tilt the mic how you want. This may seem gimmicky - moving the mic stand or clip are obvious alternative solutions - but in awkward spaces or if you want to make small changes this feature could prove helpful. The Black Knight has a quality finish. The matt black coating on both mic and cradle is excellent, and Violet has gone so far as to include a removable collar to hide the stand thread at the bottom. Looking more closely at the head design, the grill is a fine mesh but also a single layer (many large capsule mics have twin layer mesh grills). This should prevent it from colouring the sound. With the mic set up, talking into it gives an immediate impression of its un-hyped sound. However, if you get in close, plosives become an issue, and with no low-cut filter, a pop shield is the only option. Recordings of acoustic guitars sound good and solid, but you may find yourself reaching for the EQ to add a bit of sparkle. On percussion and top kit such as cymbals the sound is great - we could happily use a pair of Black Knights as drum kit overheads. However, it's worth saying that if you compare it to a more 'hyped' mic, you will feel it's slightly dull. The Black Knight is a solid mic that offers something slightly different - both sonically and visually - to other models in this price range. However, it's a bit more expensive than some of the competition, especially when you factor in the suspension cradle. If you fancy something a little out of the ordinary, though, it's well worth checking out.